Remember that deadly mission from Freespace? The one where you decide to assault a Shivan Cargo Depot to collect some more info on their tech? So that you can start whipping their behinds too? 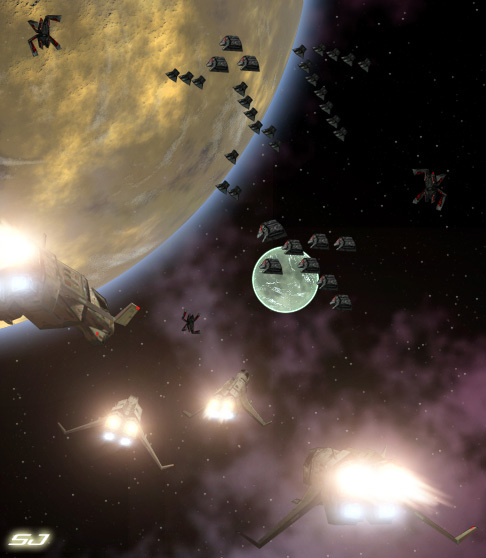 This was an early render based on the mission. I remember restarting this mission about 20 times just to be able to reach the damn cargo containers before they are blown up by the Shivans... the second the mission would start I'd push the throttle to full, set all power to the thrusters, and hit the afterburner, all in the fastest interceptor in the game. Unfortunately it seems the mission is designed to be impossible. But hey, if you did manage it ever, do brag about it in the comments section below! The model of the GTF Valkyrie used for this render is from the game Descent FreeSpace, a brilliant space simulator from Interplay and Volition, released March, 1998.